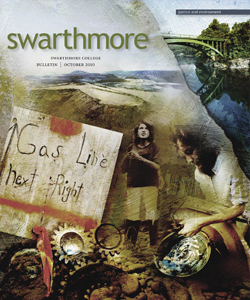 A college campus that also houses an arboretum is expected to boast its fair share of colorful plants and trees, especially in the fall. An all-season, all-over red tree is a less likely sight. Particularly one with no leaves. 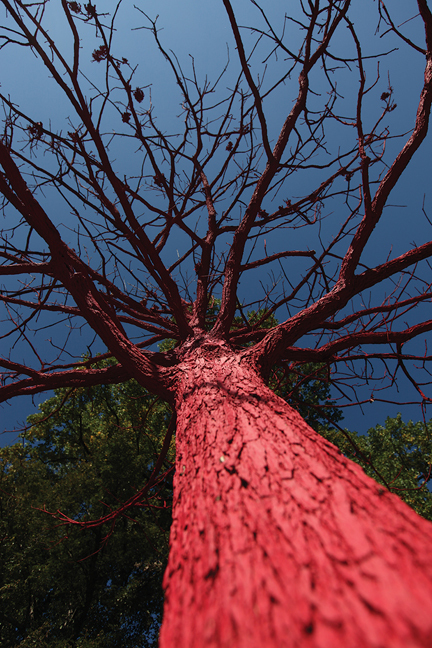 The bright red tree is the most recent addition to a Scott Arboretum project that uses dead or dying trees as art objects. 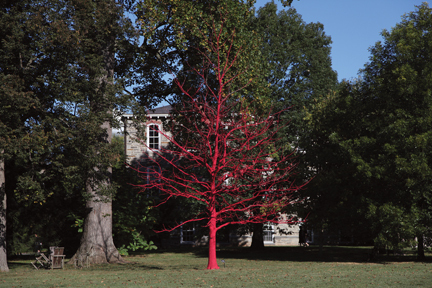 In 2006, a Chinese maackia tree suffocating from construction compaction was painted blue by an arboretum curatorial intern. The current art tree is a dying 10-year-old bur oak (Quercus macrocarpa) suffering from physiological problems with its roots. Temple University design graduate Sam Keitch took two-and-a-half days to power–spray-paint the 30-foot-tree geranium red. Standing on the lawn in front of Trotter Hall, the tree has been named In the Shadow of Abracadabra, appropriate to its location close to where, in fall 2000, artist Patrick Dougherty erected his twig sculpture Abracadabra on a dying Tilia americana. Sawyers likes to turn a problem (i.e., a dead tree) into an opportunity (i.e., art). She mentions the Dougherty piece and artist Marty Long’s bender oak sculpture near the Faulkner Tennis Courts as similar but more costly experiments using outside artists, adding that the painted trees are in-house examples of the same philosophy.